The 5th of September started with a severe thunderstorm advice issued for coastal areas at 8am. An intense low crossed the coast at around 10am. I was working in Fremantle and John works in West Leederville, which is right near the center of Perth. John and I were aware of the time the front was due and I experienced some squalls where I was but nothing too severe, maybe 30 knots. I phoned John at around 10am to see what he could see from his position and he said that he was getting some winds gusts he estimates to be up around 60 knots, gusting from all directions. I phoned the bureau and the severe thunderstorm advice for Perth was withdrawn at 10am, so we didn’t think at the time that it was worth a drive as winter events are basically guesswork anyway and so decided to keep an eye on it. Its seems however that a severe storm worked its way inland and the York and Chidlow tornadoes were spawned from this storm at around 11am. 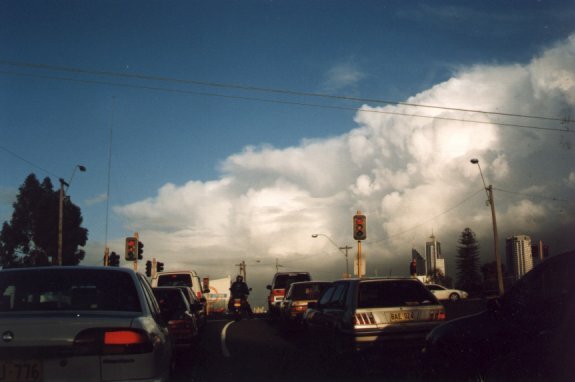 At around the same time a tornado near Ravensthorpe occurred 500 kilometres to the south. Towards the evening a second front passed over the coast and headed inland. John was on his way home from work and took several excellent photos of a kind of multicell front. John also experienced heavy rainfall but no hail as it passed over him. The low moved inland and on the synoptic charts winds in front of the low seem to be in a southeasterly, almost easterly direction while winds in the low were obviously southerly. Basically where the winds converged is where the tornadoes occurred. That’s about all the information we have. Radar images were taken, but unfortunately they are unavailable to us at this time. A tornado was reported at Gnagarra. The Gnagarra track was however only discovered on Saturday, the 20th. It seems to be the largest track. This tornado occurred at approximately 6:00pm and seems to be a separate storm from the Chidlow and York events. 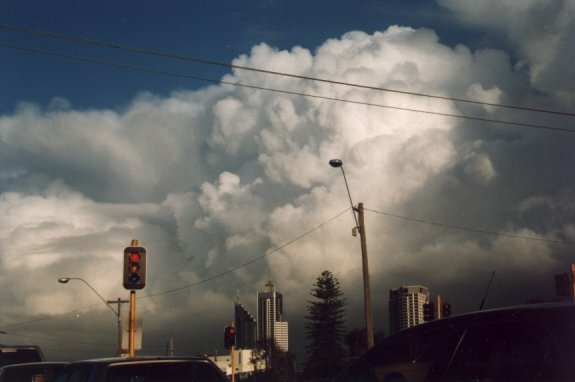 This tornado occurred in the front that John photographed at 5pm in Perth. The tornado touched down in a pine forest about 40 kilometres north of Perth. The track runs for about 3.5km in length and is 100m wide. The track is generally in an easterly direction but it does change direction quite a bit with two 90 degree turns, one left and one right to form an almost S shape. John and I walked up to the touchdown point and right from the start the damage is extensive. It doesn’t kind of work into it like the York track - it's there straight away. 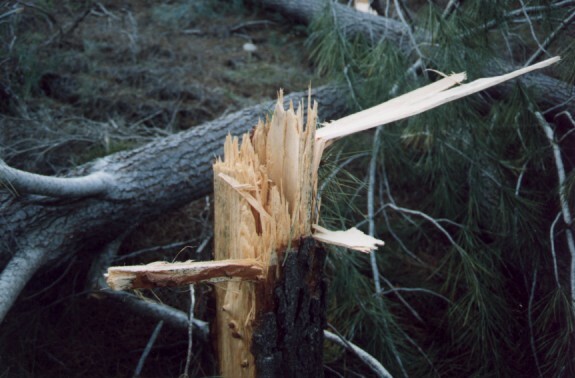 99% of the trees in the track have been snapped off around 3 to 4 feet high. All trees are down in the track. 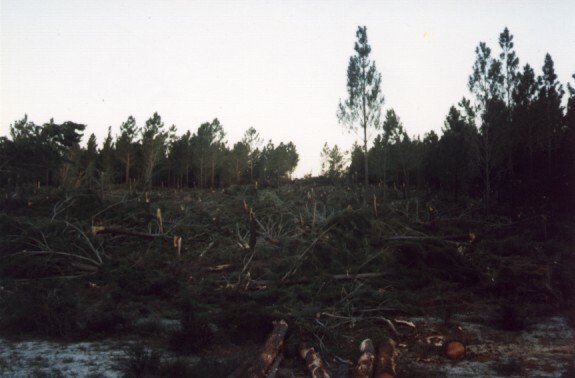 This is a pine plantation and the damage just looks like a large bulldozer has been driven through, its quite awesome to stand in a spot and see so many trees down with such a defined edge to the track. It's certainly the largest track John and I have seen. There is so much evidence of rotation that it's not funny. Trees are down in all directions and we found branches about 200m back in the forest. One tree has the front half of the tree to the left and the back half pulled of to the right. At the end of the track branches and various other debris were found 2km away in a paddock. These are only soft wood pine trees but we found several larger trees and they were still snapped off like the smaller ones. The length of the track is also a credit to its strength plus the tornado also had to climb two ridges and kept itself going for quite a distance. It was rated as an F1. The York tornado track is about 1km long and about 300m wide. The track for this tornado is about 20km in on west Talbot Rd (off the Hwy. to York) and starts right near Catchment Rd. The track runs directly SSE. It is about 300m wide at its widest point. From the start the track it is kind of egg shaped, fanning out from to its widest point and then coming back in again. It seems to dissipate just as it got going. There are many large healthy mature gum trees down with lots of evidence of rotation. There are trees de-barked, tops twisted off, branches driven into the ground and fallen trees lying in all different directions. Most of the damage is consistent with an F0 tornado, maybe F1. The Chidlow Tornado did some minor tree damage and two houses were damaged by debris. We have not been to investigate this track as it was cleaned up straight away and the Bureau told us there was not a lot of damage anyway but that it definitely was a tornado, the path was 1.5km long by 200m wide. The fourth tornado for the day was observed down south near Ravensthorpe. The man who witnessed and photographed the Northam tornado Colin Crane, was the lucky observer. I phoned him to get a description of it he said that he observed the tornado for about 20 minutes at a distance of about 20 to 30km. The tornado was moving directly toward him so speed was hard to gauge. He did say that he could see debris flying around the base and being tossed outwards. No rating has been given. He also told me of a friend of his who is also a farmer who watched a tornado touch down in an open paddock next to him and then move on up through the paddock the day before. He is a storm spotter and reported the tornado. No damage estimates are available but it was recorded as an F0 by the Bureau. That makes five tornadoes in 36 hours ! !